In a generation where technology is vastly taking lead in areas of life, it’s essential that we keep ourselves updated with the constant changes and innovations being introduced. With this being said, why not bring new innovations into the comfort of your own home. With Siemens, this is more than a possibility. The exclusive induction hobs and stylish accessories create the perfect cooking experience. Preparing a meal won’t have to feel like a chore anymore, but instead be an enjoyable experience, impressing you and your friends whatever the occasion. 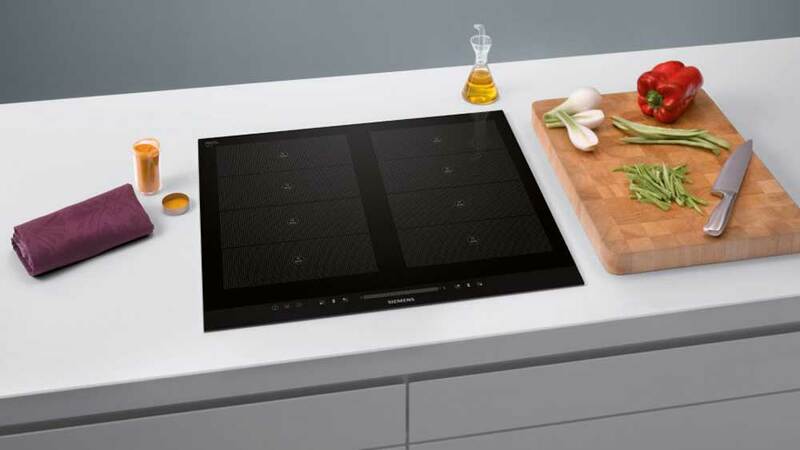 The new flexInduction hobs allow a quick, safe and most efficient way to cook. When a ferrous or magnetic metal base pan is placed on the hob, the coil situated below the ceramic surfaces uses an electromagnetic field to create heat, instantly heating the pan. The hob itself does not produce any direct heat, the only heat on the surface is that which has been transferred back from the pan, so the cooking zone stays cooler. Say goodbye to extensive cool-down periods and burnt food on the hob, saving you time and energy. This ensures your hob only needs a wipe-over, no more stubborn stains or scrubbing, ensuring the smooth glass surface looks pristine for many years to come. The wider-than-regular cooking zones of the EX8/9 models provide more space for any kind of pot, with one touch of a button merging two or more zones together. The clean finish of the flexInduction hobs seamlessly blend in with your worktops, making cleaning and visualization of your kitchen softer on the eye. What’s more to ask for from a hob? Adding to the ultra-modern features of the Siemens hob, a touch slider is neatly designed into every flexInduction hob, allowing you to slide your finger across the power level scale to the desired setting. With control advances in half-levels from 1 to 9, you have the liberty of using your hob at specified temperatures and settings, precisely cooking to make the perfect meal. Come visit our amazing showroom to try our working models for yourself. The new and exclusive Siemens studio line freeInduction cooktop provides cooking without limits, featuring innovative induction technology for quick, safe cooking. 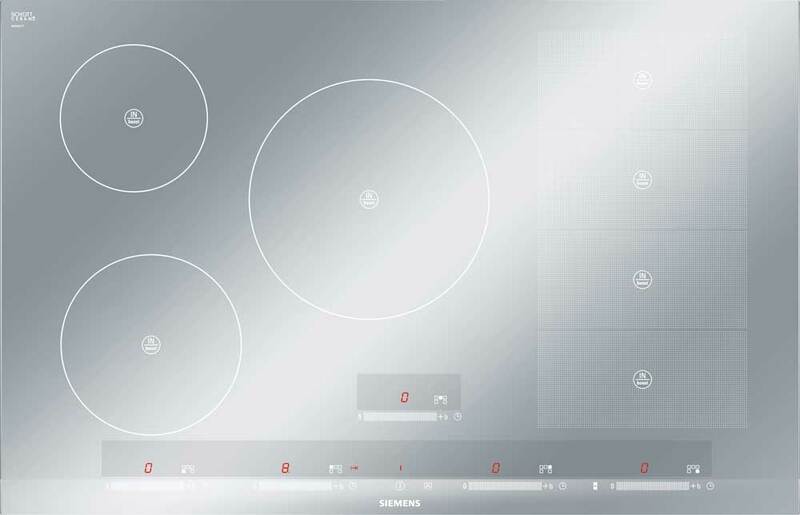 Regardless of size and shape, you can place your pots and pans wherever you want and the cooktop will automatically detect the position, size and shape of your cookware, thanks to micromodule technology. Tired of buying multiple accessories to use on your hob? The smart technology of Siemens flexInduction combined with new easy to use accessories makes using the appliance simple. Specific to the flexInduction, The Griddle pan, Teppan yaki (available in two sizes) and roasting dish with steamer are specially designed to cook your food at a professional level, covering 3-4 zones of the hob for even cooking levels. The cookingSensor plus simply attaches to your pot, interacting with the cooktop to give a signal when a certain temperature has been reached, consistently keeping it at that exact level to avoid over-boiling. How’s that for temperature control? Available in two different sizes, 90cm and 60cm, the flexInduction EH8 model comes in black and silver glass with six key features for a full, new-age cooking experience. The uncompromising design, innovation and technology of the 2017 Siemens collection is the lead into the future and it’s our job to keep you informed. Want to know more about your potential future Kitchen appliances? Visit our website https://www.lowerbarnkitchens.com/ for more information. For a chance to get 15% off selected CDA ovens and 20% off all porcelain flooring subject to terms until 31.08.17, click here.